In this small book, a cheap volume intended for sale at railway stations, John George Wood describes some basic gymnastic exercises. He covers exercises both with and without apparatuses, such as parallel bars, poles, and ropes, with accompanying illustrations of the exercises described. Although published under the pseudonym of "George Forrest," this edition advertises the entire Routledge Sixpenny Handbook series on the back cover, where Rev. J. G. Wood is named as the author. 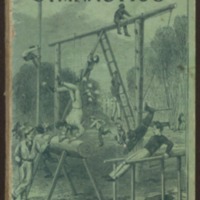 Among the other titles in the series are handbooks on "Croquet," "Swimming and Skating," "Billiards and Bagatelle," and "Manly Exercises."